Poor Cinderella, whose work is never done. The rendition of Cinderella I knew as a girl. 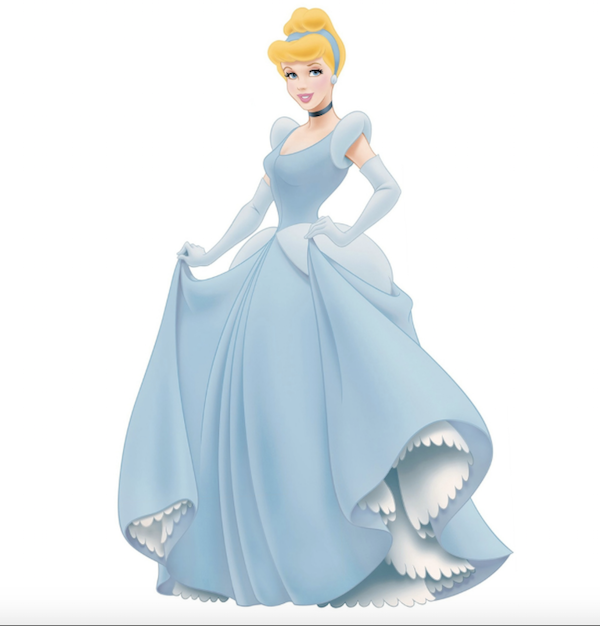 I believe it’s time to give Cinderella a break and bring her into womanhood in a way those of us who grew up believing that the prince was surely right around the next corner can appreciate so I’m setting her up in beautiful surroundings of her own making in the South of France—a sophisticated garden-inspired home that will be the envy of wicket stepsisters everywhere! But before we spend the day shopping for furnishings, which she will find quite easily by revisiting The Decorative Fair event of this past April, I feel we’re in need of a different visual than the above image of the early Disney Cinderella in her ball gown and long white gloves that was ubiquitous when I was growing up. 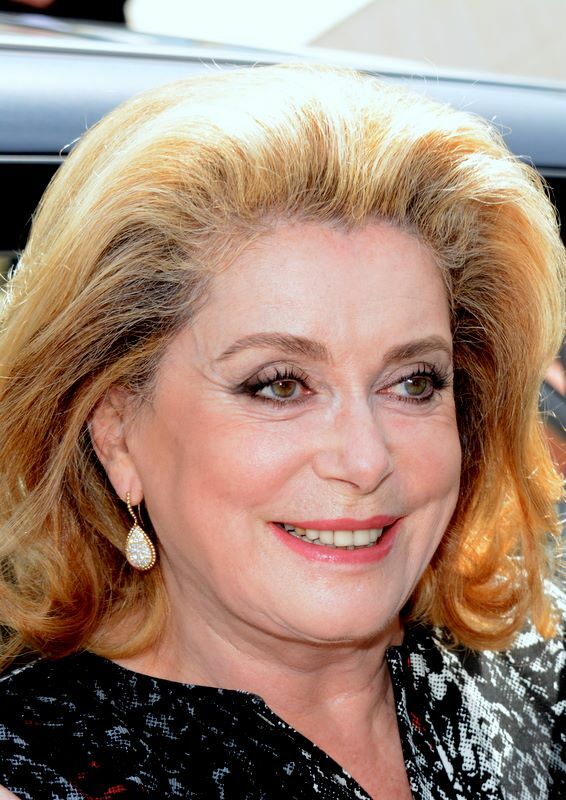 How about Catherine Deneuve as she is now, as striking as ever at 71? Catherine Deneuve at the 2014 Cannes Film Festival, by Georges Biard courtesy of Wikimedia. I’m not intimating that I have any idea in what direction the famed actresses’ tastes would run. I’m tapping her simply for her beauty as a visual for how the modern-day Cinderella-turned-mature-woman might look as she walks the floor of the fair. I’m presenting a number of finds I think she would relish. 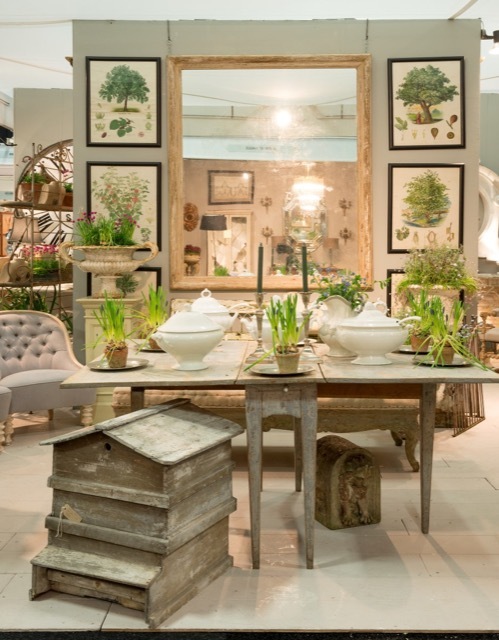 The beautifully composed stand of Patricia and Victoria Harvey at The Decorative Fair. 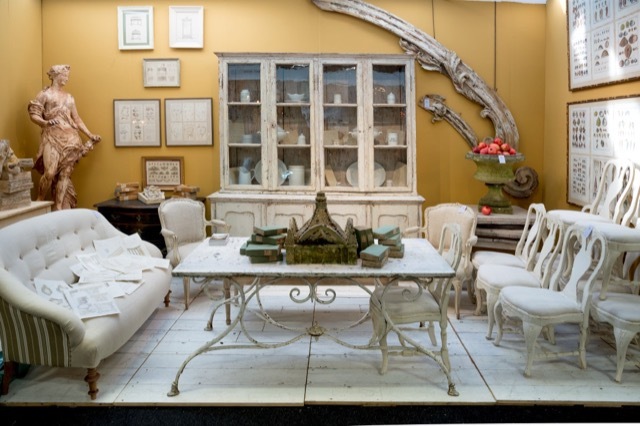 One of my favorite stands at The Decorative Fair was this one created by Patricia and Victoria Harvey of Patricia Harvey Antiques. The patina mixed with the garden-inspired décor items they brought to the April fair made me melt, and I believe Cinderella would go a bit weak in the knees as well! 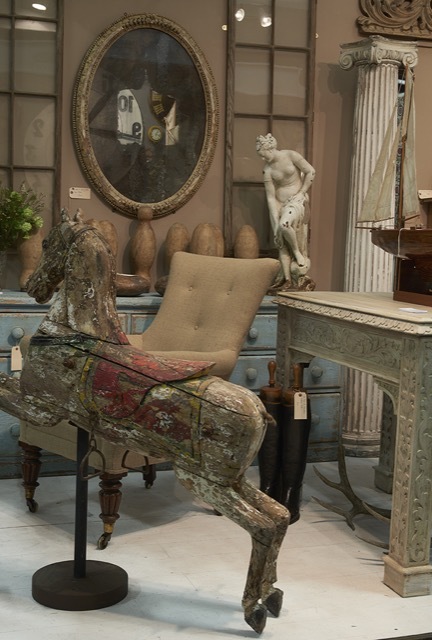 M. Charpentier Antiques composes a colorful vignette that catches Cinderella’s eye. How about a festive table set for all of Cinderella’s loyal friends she’s invited for a week in Provence? I’d be on the first plane out of New York City if my name made the list! 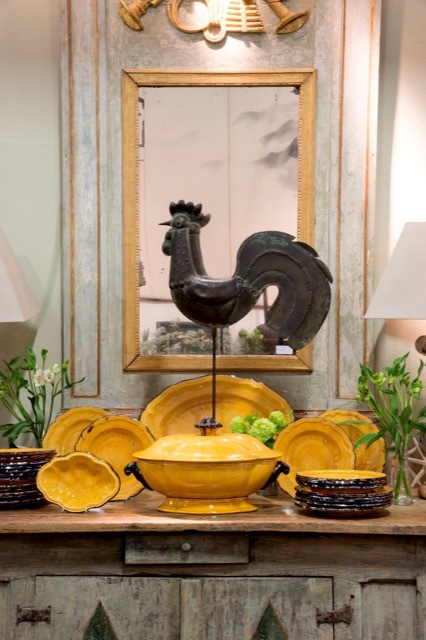 This colorful dishware, distressed cabinet and pert rooster statue were brought to the fair by M. Charpentier Antiques. Cinderella spies the china cabinet Appley Hoare brought to the fair, a standout this past April. I can see Cinderella directing one of the evil stepsisters (whom she has shortsightedly hired as a housekeeper out of pity) to find the right accouterments in this china cabinet for which she has promptly paid the stand’s purveyor, Appley Hoare—the luminous smile on her face saying it all. The French Country Living stand enthralled Cinderella. Pots and statues and urns, oh my! A garden setting, the right garden-y things must have. 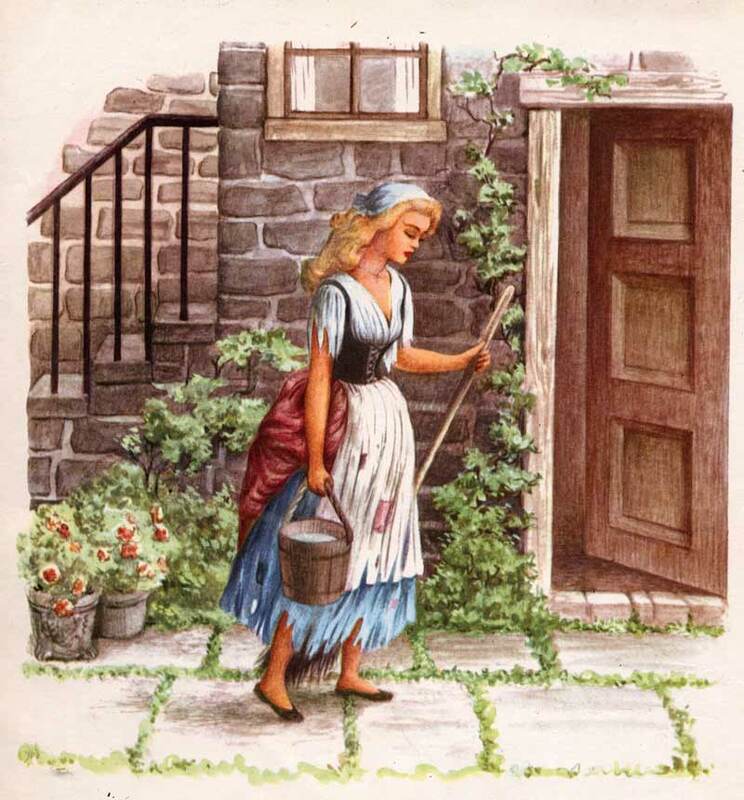 Lucky for Cinderella, there’s French Country Living Antiques. Check, check and check! 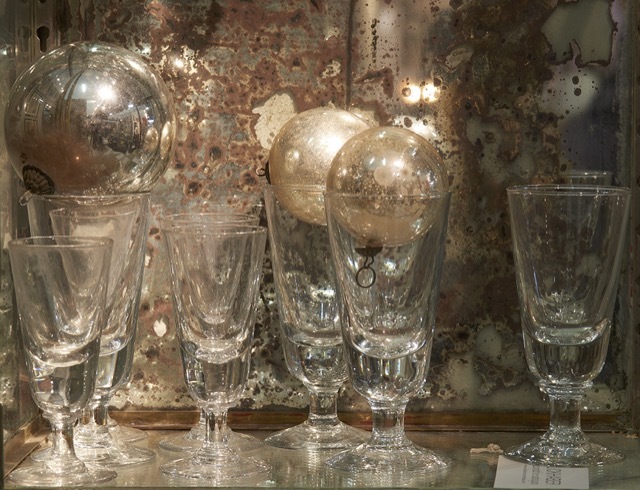 Vintage mercury glass and stemware delighted Cinderella. Cinderella becomes a bit lost in a daydream as she spies a set of vintage glasses: lost in through, she is seeing the first evening’s fete coming together as she reaches for the glassware and spies the mercury glass ornaments nearby. “Now all I need is the perfect large glass bowl to begin to create a centerpiece,” she thinks, her heart pounding as she spots a lovely Louis XVI-style chair in the next stand. 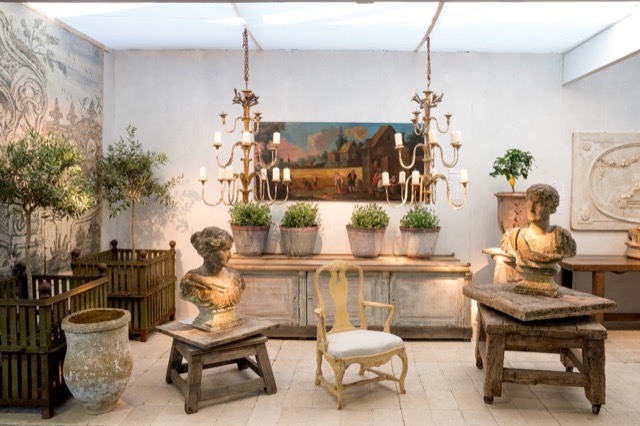 An interior view of M Charpentier Antiques’ stand. “Ah,” she muses, “the powdery blue linen on this will be just perfect in my new study!” Thank you M. Charpentier Antiques and The Decorative Fair for making this exercise in nesting so effortless! Joshua Gallery’s treasure trove of antiques and vintage. Scribbling in her notepad, Cinderella moves along but not before jotting down a reminder to ask after the wall color in the Joshua Gallery stand, which would be simply divine for her luxurious new bedroom. 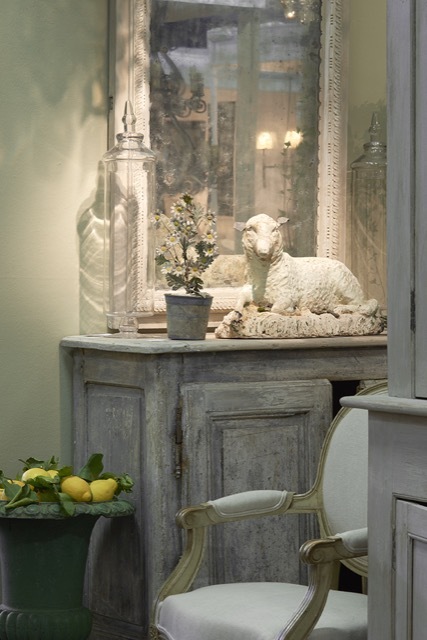 La Place Antiques at The Decorative Fair: a talent for upholstered pieces. 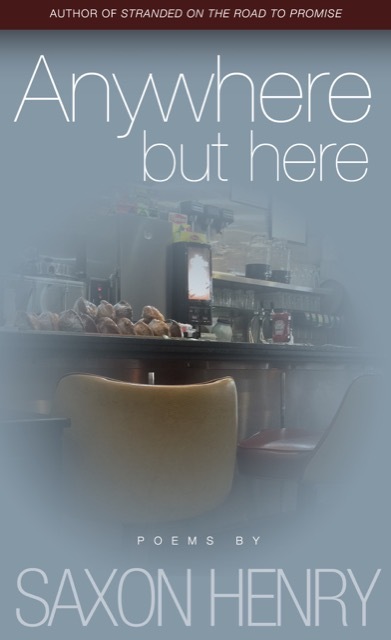 “What a talent for finding remarkable seating La Place Antiques has,” she thinks aloud, surprising the woman standing next to her perusing the stand’s period oil portraits. A beautiful fountain in Patricia & Victoria Harvey’s stand at The Decorative Fair. Stowing her pad in her Birkin, Cinderella is seriously satisfied that she has secured some charismatic furnishings, so she is off to Fortnum & Mason for afternoon tea and a shopping bag full of Timothy Dunn candles they are holding for her. It is rumored his Arabian Fig fragrance is her go-to scent when she luxuriates in her well-appointed bath! 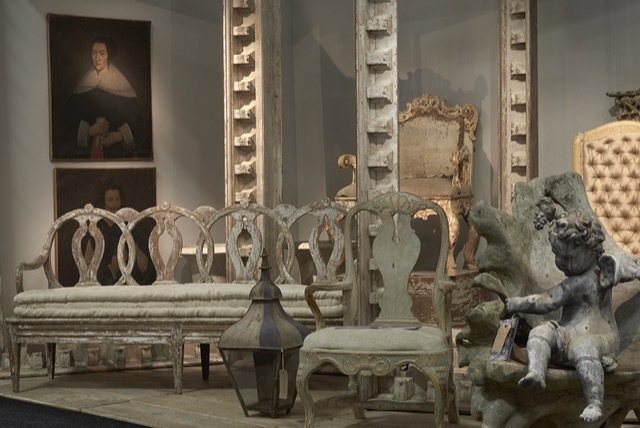 In case Cinderella’s success has enticed you to attend, the next event offers an extra treat: The Decorative Fair turns 30 this autumn, and its organizers will celebrate the fact with a lavish soirée during the fall show, which runs from September 29th to October 4th in Battersea Park. 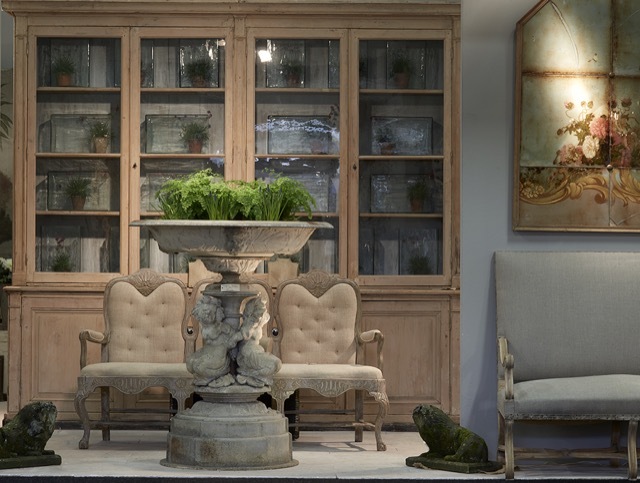 The show, which was founded in 1985 when London-based decorative antiques dealer Patricia Harvey and her husband Ralph created it expressly for the interior design trade, is now owned and produced by David and Jane Juran, who purchased it in December 2008. 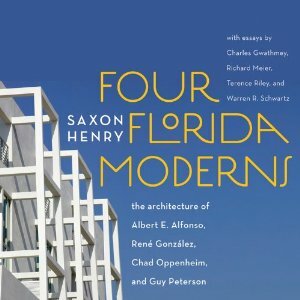 During the fall show, 145 dealers will bring with them painted, decorative and fine antique furniture; rare and unconventional objects; textiles and collectors’ items; elegant 20th century design, dating from the 17th century to 1980 (the dateline was 1950 when the Fair launched); and art of every period from antiquity to contemporary. Oh, and such an array of garden furnishings and ornamentation, you can bet Cinderella will be back! The Modern Salonnière and Cinderella in the South of France © Saxon Henry, all rights reserved. 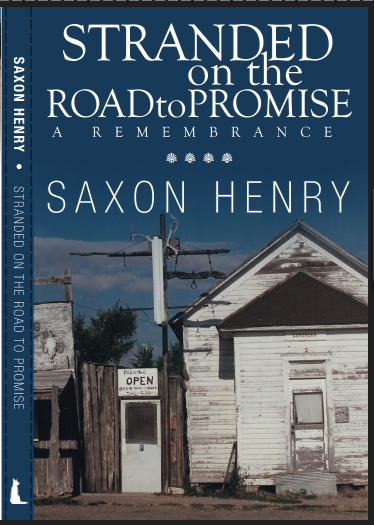 Saxon is an author, poet and strategist. 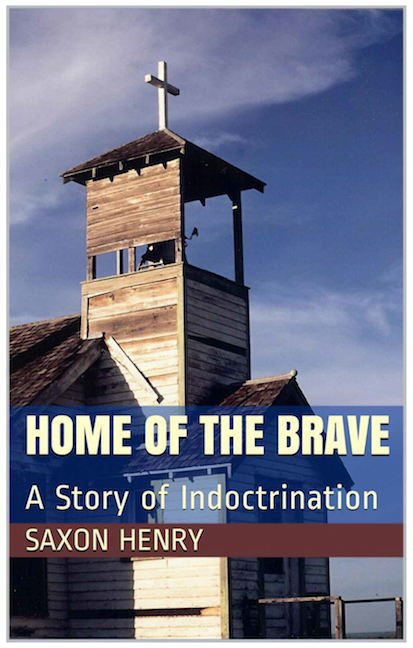 Her books include Anywhere But Here, Stranded on the Road to Promise and Four Florida Moderns.